On Saturday, April 14, Susan Godman Rager, Governor of the Chesapeake Bay Company, was one of approximately 250 University of Richmond Law School alumni and guests who traveled from the Hotel Jefferson in Richmond to Jamestown Island for the unveiling of a plaque presented by the English Inns of Court to commemorate the 400th Anniversary of the founding of the Colony at Jamestown in 1607. The plaque was presented by the Rt. Hon. Lord Phillips of Worth Matravers, Lord Chief Justice of England and Wales. There were a number of distinguished British guests who witnessed the ceremony, including the Rt. Hon. Lady Justice Arden, D.B.E., Court of Appeal of England and Wales, the Rt. Hon. Lord Mance, Law Lord, Appellate Committee of House of Lords, United Kingdom, the Rt. Hon. Lord Justice Rix, Court of Appeal of England and Wales. Distinguished American participants in the ceremony were the Chief Justice of the United States, John G. Roberts, Jr., Justice Sandra Day O'Connor (Ret. ), United States Supreme Court, Justice Donald W. Lemons, Supreme Court of Virginia, and Chief Judge Deanell Tacha, United States Court of Appeals for the Tenth Circuit. The group traveled by motorcade from Richmond to Jamestown Island, arriving in time for the 1:45 p.m. ceremony. 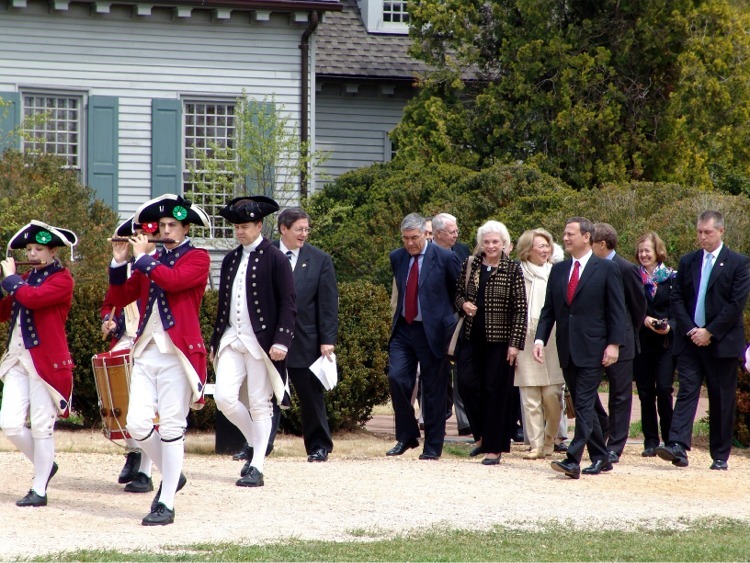 Dignitaries were escorted to the tent on the lawn near the Archaerium by the Jamestown/Yorktown Foundation Drum and Fife Corps. Introductions were made by Justice Lemons, and at 1:50 p.m. the plaque was unveiled and presented with remarks by Chief Justice Roberts, Lord Phillips, and Justice O'Connor. Following the unveiling, the group attending enjoyed a reception and touring the Archaerium. 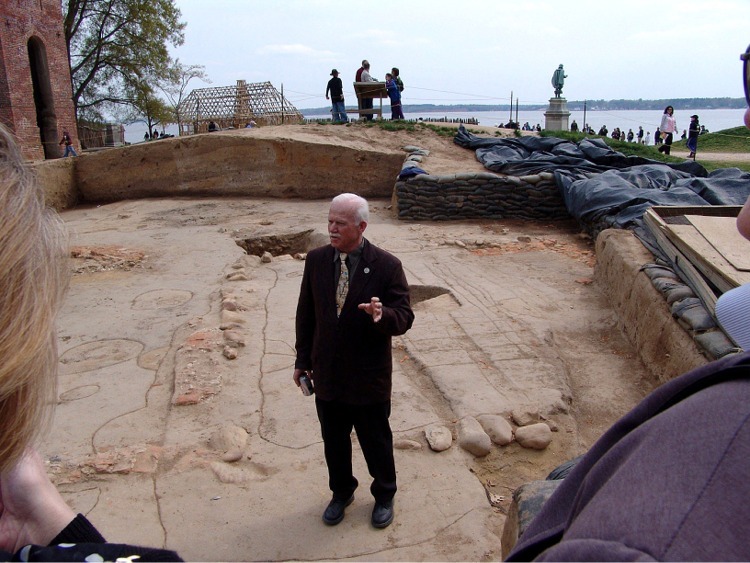 Tours of the current archaeological dig near the Memorial Church were led by Dr. William Kelso, whose pioneering efforts over the years have been responsible for most of the knowledge of the early Jamestown community. The Rule of Law Conference, which took place April 11-14, was sponsored by the University of Richmond Law School, as part of a national effort to commemorate the founding of the first permanent English settlement in Jamestown 400 years ago. The conference was part of a series titled "Foundations and Future of Democracy." Former Presidents George H. W. Bush and William J. Clinton and former Prime Minister Margaret Thatcher are the Honorary Chairs of the conference series. Justice Sandra Day O'Connor (Ret). is the Honorary Chair of the America's 400th Anniversary commemoration. On Thursday, April 26, the first of the re-enactments of the landings by the Jamestown settlers took place. 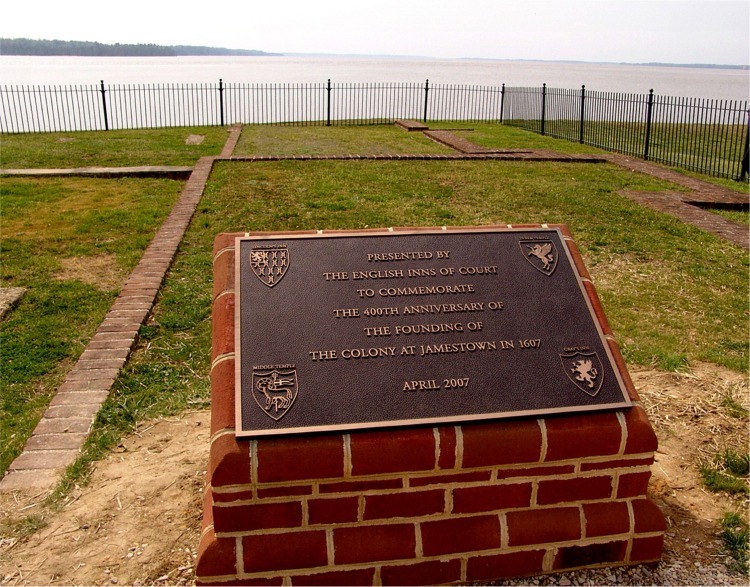 April 26th was the 400th anniversary of the coming ashore at Cape Henry, which was the first landfall made by the English explorers before making their way up the James River and choosing Jamestown as a place of settlement. 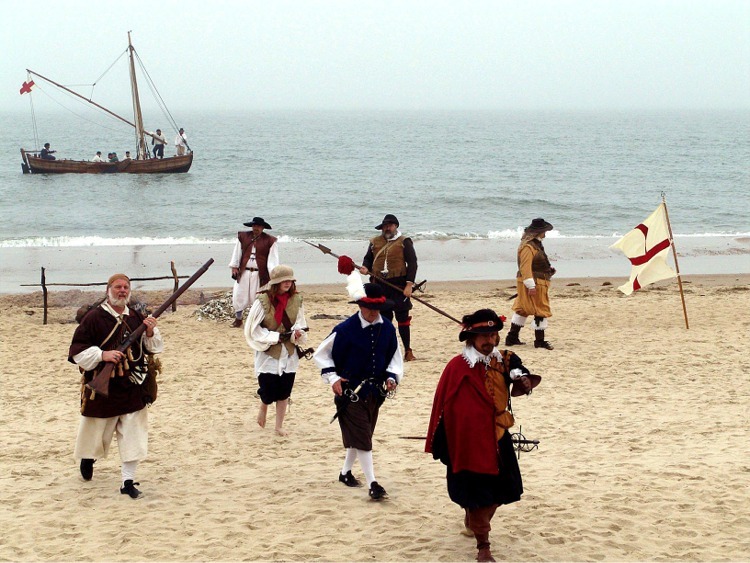 The April 26th re-enactment took place at First Landing State Park in Virginia Beach. 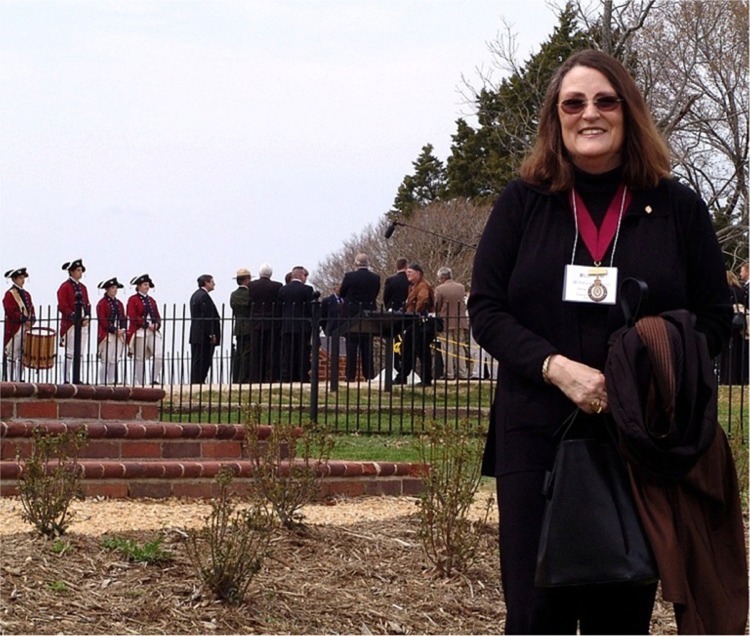 Susan Godman Rager, Governor of the Chesapeake Bay Company, was among the attendees. The re-enactments scheduled feature the replica ships from Jamestown Settlement Park, as well as smaller shallops. Re-enactors from Richmond portrayed Captain Christopher Newport, the Reverend Hunt, Bartholomew Gosnold, and others on that first journey. While fog prevented the three ships from participating, the smaller shallops were on hand. (Aren't we glad that our ancestors were not as deterred by weather conditions such as fog 400 years ago?). Other re-enactments took place in between April 26th and the 400th Anniversary Weekend, at various sites along the James River. 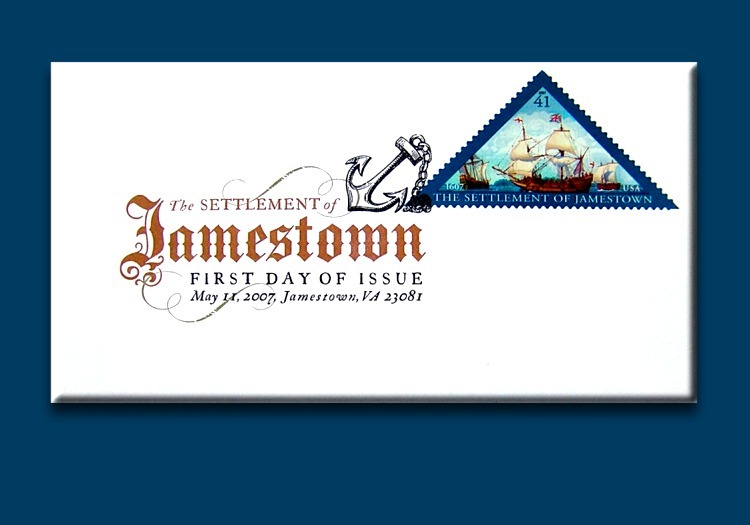 On Friday, May 11, the United States Postal Service introduced the 41-cent Jamestown stamp, which features the ships Susan Constant, Godspeed and Discovery. The stamp is in the shape of the fort at Jamestown. Only 60 million of these stamps have been printed, and will likely be coveted by collectors. They are on sale at United States Post Offices until the supply runs out. First day covers were available at the Historic Jamestowne Visitor Center on Jamestown Island.